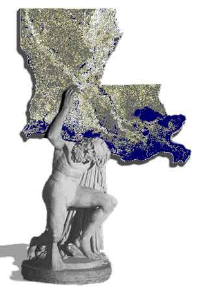 The Louisiana Atlas Website has evolved from its beginnings in the work related to the Louisiana Coastal Geographic Information Systems Network (LCGISN). The objective of this web site is to make available to the public data and information related to geographic information systems (GIS) in Louisiana, GIS data documentation, and data sharing on the World Wide Web (WWW). This page is currently maintained by the CADGIS Research Laboratory at LSU in Baton Rouge, Louisiana, a lab supported by the LSU College of Art and Design and the LSU Department of Geography and Anthropology. The CADGIS Lab teaches computer-based courses and facilitates research in the areas of computer aided design (CAD) and geographic information systems (GIS). We encourage anyone using this web site to e-mail your suggestions, requests, problems, & concerns. All input is taken very seriously & is greatly appreciated.